Fans can now pre-order Screaming Trees' final album directly from their label and get their copy a month before it reaches retail store shelves and online retailers. Sunyata Records is the label run by Barrett Martin, the once again former drummer of Screaming Trees, and he announced on Facebook CDs are being pressed at the factory in preparation for a full rollout. As we reported, Last Words:The Final Recordings was released August 2 as a digital-only release with a planned release on physical media planned for the fall. The CD should be available to order everywhere in October but those who pre-order from Martin's Sunyata web site will get theirs sometime in September. 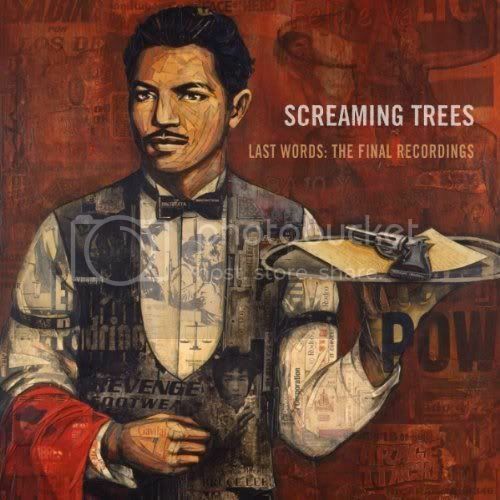 Last Words was initially recorded by Screaming Trees in 1999 but the band parted ways to pursue different projects before it could be mixed, mastered, and released. The tapes were rediscovered and Martin and famed producer Jack Endino set out to transfer the 2" tape to digital format, mix, and master the record. With the band's blessing, the final 10 songs of the Screaming Trees canon entered the world and that process comes full circle with the CD release. I've always loved Screaming Trees and Last Words was one hell of a sendoff for one of the great rock bands of their generation and was a complete surprise to me. I made peace with the idea Dust would be their last will and testament and it would have been a fitting one. It's an elegaic masterpiece haunted by ghosts and spirits, ruminations on mortality, and love won, lost, and wasted. Hearing these songs made me yearn for them to return, to reform. I never had the chance to see them live. Even though these songs aren't really new, the freshness and vitality in them makes you think, just for a moment, the tank can't really be empty, can it? Listening to these songs was bittersweet. It's a fantastic record but it really will be the last words they will ever speak to us, having amicably come to the conclusion they've run their course together and can be proud of the music they made and enjoy one another's company once again as friends. So... do your part, boys and girls. Download the digital and/or pre-order the physical. This is the final chapter of a story that has meant an awful lot to an awful lot of us. One last time, we thank Lanegan, Barrett, Van and Gary Lee Conner, Mark Pickerel, and Josh Homme. Thank you for your music, the stories you told, and dreams you spun. And remember: if you want to play one last show, I hear Huntsville, Alabama is nice this time of year.